Annie and I took a trip to the seaside last week. I had grand plans to drive her all the way from Santa Cruz to San Luis Obispo on Highway 1, but alas, we didn't get quite that far. It turned out that a substantial part of Highway 1 had slid down the cliff during a recent heavy rain—as it tends to do every so often—so the road was closed midway. I was sad not to be able to take Annie all the way down my favorite part of the California coastline, but still happy to be escaping Visalia. Instead of making that a big coastal loop, we drove straight over to Cayucos, a tiny little seaside town on the central coast. It was the day after Memorial Day, and though we knew it must have been a busy weekend at the beach, by Tuesday afternoon when we showed up the town seemed deserted. We pulled in right in front of a fish taco shop and an ice cream store, so naturally we kicked things off by feasting on fish tacos and ice cream (see photo). We also had the good fortune to find a beachfront motel room at the Shoreline Inn...By The Sea!, for shockingly less cash than I'd expected to be charged for a beachfront room. From our deck at the Shoreline that afternoon we watched a pod of dolphins pass through the waves, headed North on some mysterious dolphin mission. One favorite moment: Driving up the coast awhile before sunset and pulling off at a vista point to watch the sea. We grabbed our always-handy backpack chairs out of the trunk and set them near the edge of the cliff. There we reclined, looking off into the horizon, as the sun sank lower and lower and sparkled off the water. Soon, two noises caught our attention. 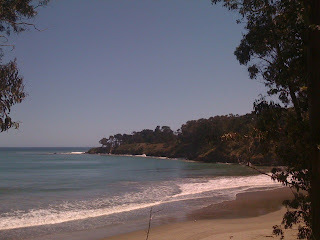 One, the gargling, bellowing, snuffling sounds of at least fifty elephant seals lounging on the beach below. I knew that they migrated to this beach every year, but Annie had no idea they were lurking down there and was quite captivated by their size and numbers. Most of them just laid on the beach sleeping, but a few were shuffling about in the sand and a few more could be seen bobbing around the rocks offshore. The second sound was a little harder to identify. Thwap thwap thwap! And then again, clearly and unmistakably from the direction of the ocean, thwap thwap thwap! It took a moment for our eyes to focus on the sound, but eventually we saw it: an otter, floating on his back in the foam just offshore, vigorously banging some kind of abalone or oyster on a rock placed on his belly. The thwap!ing went on the entire time we were sitting there, and at one point the first otter was joined by two more. Then all three of them could be seen, up close and personal, little fists clenched around their clams or whatever, working hard to get dinner open and into their mouths. Above and behind us, the clouds turned purple over the hills and birds swooped down into the sea. We were surrounded by nature, and it was so very alive. (Sunset photo taken later that evening). 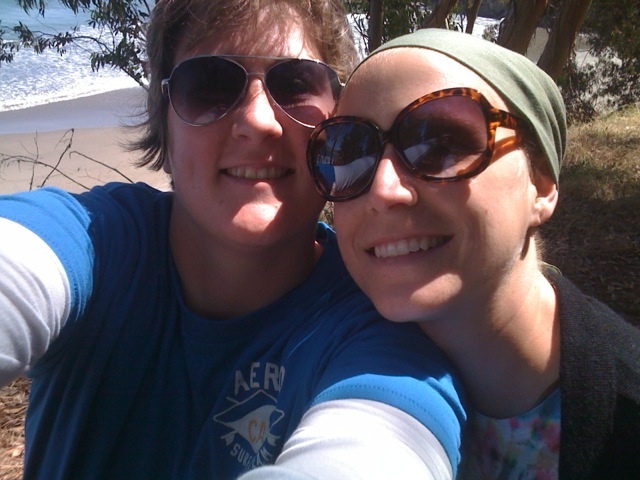 Our last day-and-a-half was spent visiting with said dear friend Abby at her parents' house in Morro Bay. Her mother, being a realtor and having a flair for interior design, has decorated the house like something out of an episode of HGTV programming. Like a page of a magazine. (Sadly there is no photo evidence to back up this statement). But believe me, with the windows in the front of the house facing the bay and the ones in back looking out upon golden rolling hills, it felt like luxury palace we would love to reside in—for a lot longer than two nights. If only! Why oh why couldn't my parents have retired on the coast instead of staying on forever in dreary old Visalia? The question must be asked at least once while laying in Abby's mother's king size bed, staring out the window and watching the sea in the distance—or really anytime one is contemplating the gorgeous vast blue openness that is the Pacific. Oh, to be able to open a backpack chair and stare into the ocean whenever one had the inkling. It was a terrific trip. But those days are behind us now. As two weeks have passed since I left the hospital, it is now time to return for another round of orange cancer-sauce. I am sitting upon my latest hospital bed as I type this. As for the cancer—what cancer? There may still be some mutant cells hiding out in various nooks and crannies of my insides, but their numbers have been so minimized that I don't experience Cancery Symptoms anymore. I'm getting the impression the doctors can't really be sure when its' gone for good. Hence the excessive numbers of rounds of chemo. Just keep on blasting away at a foe we can't really see, that seems to be the method here. Plus, to take the added precaution that the cancer cells not migrate to my spinal fluid and set up shop in there, I have a spinal tap to look forward to this week. For that procedure, I'm told, my doctor will take a hideously big syringe and inject a nice squirt of oh-so-toxic methotrexate into my spine. From there the drug will travel along wherever spinal fluid goes, exterminating all the cancer cells in its' wake. As I certainly don't want cancer cells hiding in my spinal fluid, I support this procedure in theory. We'll see how it goes down in reality. Still, things could be worse. Muddy Waters is playing on Pandora, my window lets in a substantial amount of light, and I haven't been hooked in to any tubes yet. Annie is playing poker on her iPad, and things are mellow. So far no neighboring patients have started screaming out begging for death, so that's cool too. I've got my crocheted jellyfish hanging from the IV stand, my inspirational photos on the walls. I have two books to read, a library of crossword puzzle and little game-books, a deck of cards cards, a cribbage board, and more. My gig is rigged, in other words. Now I just have to make it through the week. Now I like Visalia but I really love the central coast. Most all of us in the valley enjoy that escape. Since your parents aren't in Morro Bay, perhaps you might consider living there when this junk is all finished. And as soon as this junk is finished you really must take that drive up the coast. Big Sur is my favorite. Eucalyptus groves and seaside vacations sound lovely. 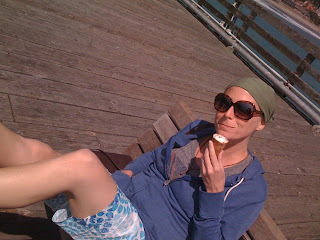 I'm glad you're enjoying these beautiful moments in between the spinal tap and chemo drips. Oooo, I saw Muddy Waters in concert at the East Campus of Univ. of Nebr. in Lincoln in 1970 with Dace and Steve Burdick... Loved Muddy and his music is awesome. Good sound choice. Wow, you did up the ocean right nice. My faves are sea lions.... arrunh, arrunh. So if you are in the traveling mood, where will we all traipse off to for a day or two? May the road rise to meet you and the sun shine gently on your back and the rains fall softly on your fields and the damn chemo week pass by quickly... an Old Irish Saying. Nothing like the ocean to heal the soul...otters are so cute working away at there dinner, i would probably starve as an otter too much work for so little food. Glad you got to show Annie some of the beauty of calif.